After becoming convinced that a new and better book on AIM investing was needed (see Part 2), I took two approaches to helping investors find the best investments for AIM. One, let the experts pick good companies & let the investor see if the stock met my basic rules. Second, I let readers explore how *I* selected the stocks & LEAPS I picked for my own portfolio. Now investors had the two things they needed – a good method and the stocks that worked best for AIM. I also realized many investors are afraid of buying individual stocks. So I thought a chapter on how AIM would make great profits with even the most conservative of stocks would be very comforting to many investors. For a conservative model portfolio I selected seven phone companies, the big three automakers, and National Semiconductor. With these 11 very conservative stocks, my portfolio value went up 57% in three years. AIM worked! Now even conservative investors would see that AIM was for them. Here I went off on my own from Mr. Lichello. He lumped all 10 stocks together for AIM. I felt each stock should be on its own. I would prove to readers I was right. I wanted to show lots of examples of how AIM worked in the real world. The chapter on semi-aggressive stocks I was especially proud of. This chapter showed the best type of stocks for the small investor. I wanted to show small investors that AIM was for them too. Here I introduced another important improvement to AIM. I showed investors how to readjust their cash/stock ratio back to 2/3 stock, 1/3 cash for very conservative investments. But LEAPS would always be 50% cash and 50% LEAPS. Based on this idea I added a chapter showing investors that in reality they only had one cash fund for ten stocks. I showed investors how to maximize their profits by aggressive use of their cash fund. That was another Weber improvement for higher profits. Every time I found a way to improve AIM, I added it to my book. On one of my 75 spreadsheets, I noticed a stock (Campbell Resources) that had started at $6 a share. Three years later, it was selling for $2.37. When I checked the bottom line, I found that the stock had made a profit of 38% over 3 years using AIM even though it was down 62%! What I learned from that spreadsheet I used to show why and how AIM works. I think investors feel better about using AIM if they understand how it works. Then I thought I should show investors that taxes from profits aren’t hard to do. So I explained that expenses like commissions can be deducted from profits before paying taxes. Then I wrote two chapters on how AIM worked for both large and small investors. I picked a seven year cycle and showed investors how to manage AIM over the long term. Lichello didn’t explain when to change stocks, how rich stocks can help poor stocks, and how to use profits from existing investments to add new stocks or LEAPS. A complete guide to AIM investing should have all of that information in it, so I added all of that to my first book. Since picking investments is so important to AIM, I added a chapter that describes the method I developed over many years. This chapter listed my ten cardinal rules for picking the best investments. I truly feel these rules offer excellent advice for finding the best investments for AIM. Once I started writing and rewriting my book, I had a simple criterion for making improvements – do they make investors more profits? All improvements had to pass the money test. And I decided never to rest on my laurels or anything else. I have constantly rewritten my book for many years, always trying to make it the best book I can. I felt one of my best improvement was reducing cash to 1/3 instead of one half. Mr. Lichello did the same thing in one of his updates. Investors make their profits buying and selling stocks & LEAPS – not earning interest on large cash balances. This was possible because of another improvement I made – I decided each investment would stand on its own, have its own spreadsheet and own buy/sell decision. But while each investment had its own spreadsheet and cash reserve, overall I treated the cash in the portfolio as one cash reserve. I used the three Musketeers approach – all for one and one for all. Thus if a cash poor stock ran out of cash on its way down, I could borrow cash from a rich stock on its way up. Later I added a bear strategy for both stocks and long-term options (LEAPS) to conserve cash and make the lowest buys in a bear market. AIM makes you the highest profits profits if you still have money to buy at the lowest prices and the rich stocks don’t even notice they’ve loaned money to the poor ones. One result of this approach is that certain stocks/LEAPS could occasionally show negative individual cash balances. This meant that in any given month you might buy shares in some investments, sell shares in other investments and do nothing with some investments. You could take advantage of whatever the investment was doing and maximize the power of AIM on that investment. This allowed for even greater profits and made AIM fun comparing each investment to see who was doing the best. This led to another idea for the Weber improvement – you are not married to your investment and sometimes parting is not sweet sorrow but a pretty smart idea. Since I teach keeping investments on separate spreadsheets, it was easy to sell one and add another. I decided to explain thouroughly when you should part with an investment under both good and bad circumstances. Another Jeff Weber modification is to put more money in your pocket. I recommended adjusting the cash/investment ratio on a regular basis. I explained how your cash could build up after a bunch of sells and then it was time to get that cash back into stocks/LEAPS where your real profits were. I showed small investors how there was a way they could grow their portfolio over time. Maybe they could only start with three investments – that was fine. Then you can use the profits from those three to buy the fourth… then use the profits from the four to get the fifth, etc..
Everything was designed to help the small investor make the most out of his money…and it was easy to do (now that I had been spending 10+ years doing it myself). The Jeff Weber method I also learned from actual experience. What if you miss a month tracking your AIM investments? So I included what to do if you skipped a month (no big deal) and how you could squeeze out higher profits by a slight delay in selling. I checked one stock at the beginning of the month and it had gone up $1.50 to $6. Hmmm…why don’t I wait another day. It went up another $2. I think I can wait another day. Hmmm… it went up another dollar. Hmmm one more day…oops went down ½ point, time to sell. So I incorporated that into my AIM method. A lot of my improvements came from actual experience over the 11+ years I’ve written this book. The Weber method also explained my ideas that understanding risk was important. I explained how I decide whether an investment was risky or not and how to protect yourself if you had a risky stock. (The answer is with a limit buy). I also explained why you want one or two risky investments in your portfolio. But the biggest and most important Jeff Weber idea was determining what are the best type of investments for the AIM method. By a landslide it was buying long-term options (LEAPS) rather than stocks. I spent a lot of time figuring out what were the best type of LEAPS to buy. I found investors can buy very conservative LEAPS and still make tremendous profits – my Dow Jones LEAPS portfolio is up 344% in last 49 months!!! And then I decided that current info is the most useful so I started my monthly newsletter showing my subscribers the best current investments and how well AIM continues to work. 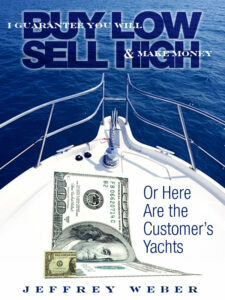 Then I learned there are many other excellent AIM investors so I incorporated their ideas into my book & newsletter. Steve Donahue offered thoughtful insights into picking the best stocks. Tom Veale, probably the smartest AIM investor ever, wrote an extremely important chapter showing us his Idiot Wave as an index to measure risk in the stock market. I gave credit to these other investors and incorporated the best of their lessons too. This book is the real deal – what investors want and truly need – to make big profits for the rest of your life with the AIM investing method. Disclaimer: Jeffrey Weber is not an investment adviser and gives only his personal view and opinion, never making any investment advice or recommendation to buy or sell specific securities. Investors in financial assets must do so at their own responsibility and with due caution as they involve a significant degree of risk. Before investing in financial assets, investors should do their own research and consult a professional investment adviser. Jeff Weber is an investor, author, and former US Army auditor. He is on a mission to help as many people as possible buy low, sell high, and earn lifetime profits using the AIM system.